Data-entry specialist Kendata Peripherals has introduced a new forms-processing software package that enables the rapid extraction of data from responses to surveys and questionnaires. Known as ScanAnPro, the software can capture a variety of different types of data from scanned forms, including check-mark boxes, OCR (optical character recognition), ICR (hand print), barcodes and comment fields. Rather than asking the operator to decide which of two marks is 'correct', ScanAnPro simply requires confirmation that both boxes are indeed marked and then records it as an invalid response. 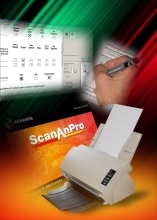 ScanAnPro can provide a complete audit trail by printing a unique identification number on each sheet as it is scanned, which is especially important when dealing with longer survey booklets as they have to be separated into individual sheets prior to scanning. A high level of data security is provided as ScanAnPro immediately stores a copy of each form's image on the operator's PC as well as on the server, so no data is lost even if the server goes down during processing. Captured data is automatically entered into an Access database, from where it can easily be exported as an Excel document or in other file formats if required. Equally suitable for high- and low-volume projects, ScanAnPro also offers adjustable thresholds for optimum check-mark reading, a logging facility for tracking operator actions, and a collation feature that automatically creates a multi-page PDF as pages are scanned.